Plus, a visit to The Mall at University Town Center's Brio Tuscan Grille. 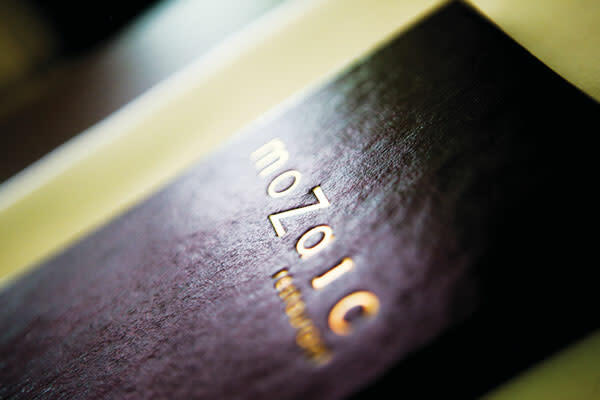 MoZaic offers a consistently fine and imaginative eating experience and has done so since chef/co-proprietor Dylan Elhajoui opened the two-story restaurant on lower Main Street more than a decade ago. He’s kept standards high, his menu fresh, and his selections adventurous without veering too far afield from his culinary roots, which are based in Morocco and France. The setting is upscale-bistro, with an art gallery and vivid sculptural light fixtures as part of the ambiance. Sit downstairs and look out at Main Street or upstairs for a cozy and private experience. 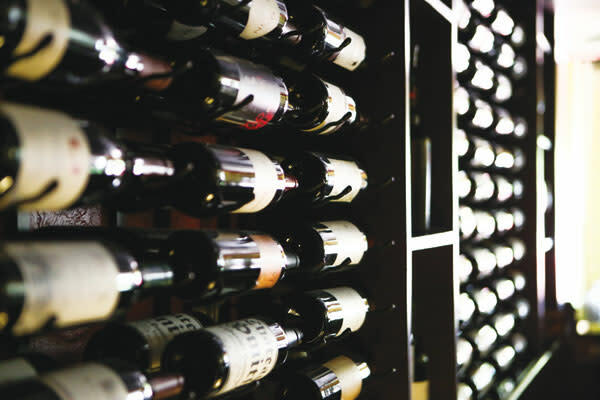 The wine list is wide and deep, and many of the selections are meant to pair with the specific kind of cuisine served. But there are two dozen wines available by the glass and the street-level wine bar is a big component of the restaurant. It’s a place to stop in, relax and sip. A Happy Hour encourages locals to expand their tasting experiences. The restaurant’s name defines the chef’s mission, which is to present a panoply of dishes from the western Mediterranean countries and North Africa—ancient countries where trade routes, European colonization and migration patterns created a multicultural cuisine. When chef Elhajoui serves his food-centric guests char-grilled merguez sausages with harissa ($10), many already know that harissa is a hot chili pepper paste and merguez is a North African lamb sausage. Over the past few years these ingredients have become as common to culinary travelers and TV watchers as couscous. But we don’t often have the opportunity to eat these foods in a local restaurant. 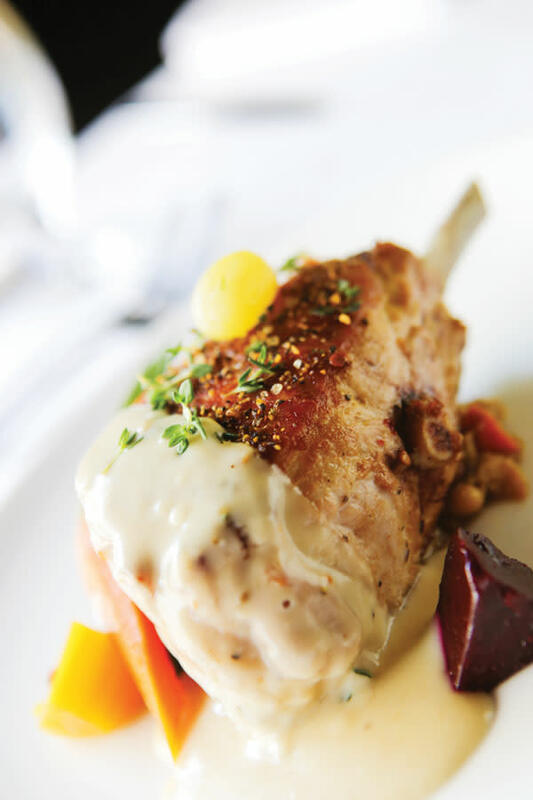 How about duck leg confit and pheasant sausage with cardamom-stewed quince and cherry bread pudding ($25)? I recently ordered it, and it truly is lovely—fragrant, rich, soulful, a gourmet version of comfort food. The kitchen routinely turns out diver scallops with carrot mousseline and lime guava vinaigrette ($32), and a juicy roasted pork chop and stewed prunes on a plate with cannellini bean ragout and apple cider brandy sauce ($26) that is deeply satisfying. 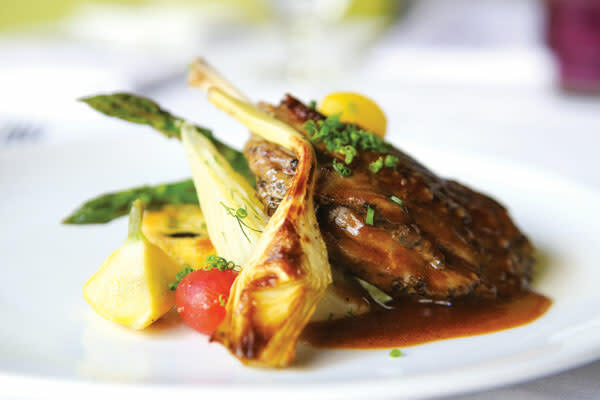 Other favorites include the cumin-spiced lamb rack with merguez sausage ($34) or Dylan’s legendary quail, or escargot and mushrooms in a creamy wine sauce. In this recipe the snails aren’t encased in their own little sauced cubicles; they roam with whole mushrooms in a shallow soup bowl. There’s no way to make this plate look as delicious as it tastes; the contents are all dull beige. But oh, my, what rich and decadent flavors. It’s offered as an appetizer for $10; I’m going to order two of them next time and have the dish as an entrée with a side salad, bread (for sopping up that sauce) and whatever wine chef suggests. The MoZaic menu also shines with vegetarian offerings, including a traditional couscous ($21) that includes ginger, lemon confit and artichokes. The wild mushroom ravioli with asparagus and roasted tomato can charm even the dedicated carnivore. 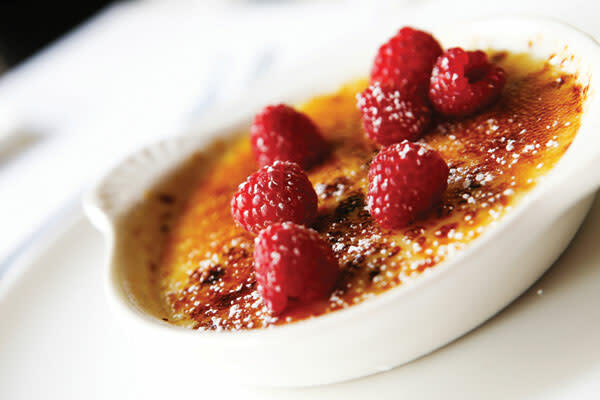 The dessert menu features presentations such as Tangier pear and flourless walnut cake, lavender-scented buttermilk panna cotta, cold apricot soup, walnut financier, or Avignon white chocolate Amaretto crème brûlée. Besides being intriguing and beautifully executed, these desserts are so artistically constructed that many guests whip out cell phones and start snapping away. But as good as it is, it could be more. I’d like to see chef be bold enough to jettison the Chilean sea bass, the Angus salad, the New York strip steak and some other “American favorites” that plenty of others in the area already do quite well. Instead, why not give that kitchen real estate to more Moroccan dishes? More vegetable, lamb or chicken tagines, or maybe for the spring menu a ferakh maamer (couscous-stuffed spring chicken casserole) or briouattes (spicy beef-rice crepes) or pastilla (meat pie with mixed nuts)? We fans of this talented chef would applaud the expansion. The Verdict: The lush and exotic flavors of North Africa and the western Mediterranean inspire Chef Dylan Elhajoui. To eat here is to experience culinary travel in a comfortable, upscale bistro environment. Hours: Dinner: Sunday, 5 p.m.-9 p.m.; Monday-Thursday, 5 p.m.-10 p.m.; Friday and Saturday, 5 p.m.-11 p.m.
Wine bar with limited Happy Hour until 6:30 p.m.
“Brio” in Italian conveys enthusiasm, spirit and liveliness, and all that applies to Brio Tuscan Grille at University Town Center mall. This large restaurant can be boisterous at peak lunch and dinner hours, both inside the cleverly compartmentalized dining room and outside at the partially covered patio, as well as at the spacious and welcoming bar. People come to eat with gusto and to enjoy the companionship of friends and family. The place has all the Mediterranean decor clichés and then some—the arches, the black wrought iron, potted palms, huge Mediterranean light fixtures, exposed brick, columns, rustic stone—all enhanced by a high palazzo-type ceiling draped with swooping gauzy fabric. The amusing ambiance, the service and the huge menu coalesce to make the most of Italian and Italian-American food, served in a place that looks more like a movie set of a swanky hotel courtyard than any eating establishment you’d find in the hill towns of Tuscany. Inside and out, the place seats about 380. It’s clear from the menu that this place means to be all things to all people (providing that everyone has a general tolerance for ubiquitous white cheese and red sauce). The Brio Tuscan Grille menu caters to vegetarian eaters, those who crave grilled meat and seafood, children, those wanting gluten-free and people concerned about eating light. About a dozen selections come in at under 595 calories, which is pretty good for Italian food. Nothing is too highly seasoned, and there are no culinary epiphanies on this menu. Good quality food and consistency are the goals. But the recipes devised by the Brio Tuscan Grille team are excellent. The flatbreads are a standout, and the kitchen says they’re made in an authentic Italian oven. The crust is crisp and thin, just short of a cracker, but easily sustains the weight of flavorful combinations such as sausage, pepperoni, three white cheeses and a smear of red sauce ($13.35). The bruschetta preparations work, too, especially the steak and Gorgonzola one with charred tomato. It’s nearly a meal at $12.95. Expect about a dozen satisfying pasta dishes, including favorites such as meat lasagna, shrimp and lobster fettuccine, mushroom ravioli, salmon and angel hair, and carbonara that features grilled chicken and spinach in the otherwise traditional recipe ($15.95). The signature pasta is rigatoni tossed with grilled chicken, seared mushrooms and a roasted red pepper sauce for $14.35. It certainly elevates chicken to something with layered flavors. Vegetarians will be glad to see a roasted veggie and whole-grain spaghetti dish that includes feta, pine nuts and fresh thyme ($11.95). More flavor in this one than you’d expect. From the grill come pork chops, lamb chops, strip steak and a filet of beef with a Romano cheese-crusted tomato ($20.45). Grilled chicken with roasted vegetables and mashed potatoes will catch the eye of those not in a Mediterranean mood. And there are about 10 items on the “light” side, such as chicken piccata, blackened tilapia, pasta pesto, or shrimp with orzo and farro pilaf and vegetables ($14.95). About a dozen desserts provide a flourishing finale, with familiar choices such as tiramisu, cheesecake, chocolate torte, crème brûlée and layer cake. The serving staff is well trained, versed in the menu, helpful and friendly without being obsequious. Brio Tuscan Grille is part of the Bravo Brio Group (based in Columbus, Ohio) which owns about 90 restaurants in more than 20 states. There are three different restaurant concepts in the chain, all Italian themed. Brio Tuscan Grille is the most upscale (white tablecloths at night). Many diners decry the mediocrity and predictability of many chain eateries that invade most shopping malls. But Brio Tuscan Grille has created a fun atmosphere with good food and a menu aimed at diverse culinary desires. The food, the setting and the service have—well, brio! Hours: Lunch and dinner daily from 11 a.m.-10 p.m.; Saturday and Sunday brunch from 11 a.m.-3 p.m.